The Exquisite Tilt Of A Spiral Galaxy : 13.7: Cosmos And Culture The exquisite warp seen here is likely caused by interactions with other galaxies. Collisions or "harassment" between galaxies is quite common and may be the most important process shaping galactic evolution. The Warp in this Spiral Galaxy was probably the result of a cosmic collision with another galaxy. 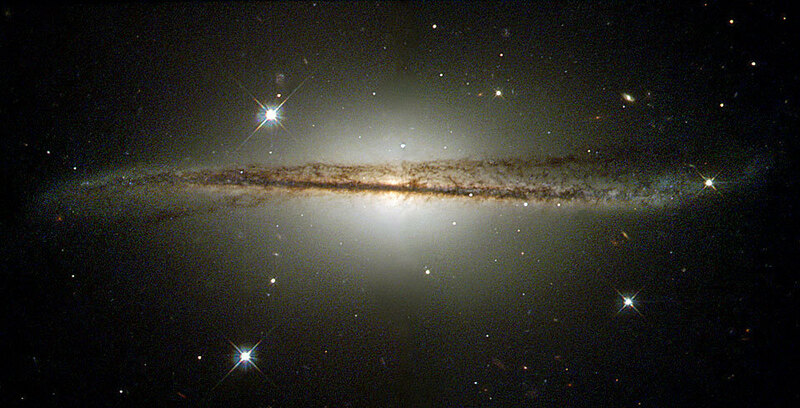 This lovely image of the spiral galaxy ESO 510-13 was featured on Friday's Astronomy Picture of the Day. A galaxy is a collection of billions of stars (gas and dust and lots of Dark Matter) held together by their mutual gravity. The exquisite warp seen here is likely caused by interactions with other galaxies. Collisions or "harassment" between galaxies is quite common and may be the most important process shaping galactic evolution.